IEC 60335-2-37:2017 deals with the safety of electrically operated commercial deep fat fryers and doughnut fryers including pressurized types with a pressure not exceeding 50 kPa and a pressure volume litres product of 200. These appliances are not intended for household and similar use, their rated voltage being not more than 250 V for single-phase appliances connected between one phase and neutral and 480 V for other appliances. These appliances are used for the commercial processing of food, for example in kitchens of restaurants, canteens, hospitals and in commercial enterprises such as bakeries, butcheries, etc. The electrical part of appliances making use of other forms of energy is also within the scope of this standard. As far as is practicable, this standard deals with the common hazards presented by these types of appliances. This standard does not apply to: - appliances designed exclusively for industrial purposes; - appliances intended to be used in locations where special conditions prevail, such as the presence of a corrosive or explosive atmosphere (dust, vapour or gas); or - appliances for continuous mass production of food. This sixth edition cancels and replaces the fifth edition published in 2002 including its Amendment 1 (2008) and its Amendment 2 (2011). This edition constitutes a technical revision. This edition includes the following significant technical changes with respect to the previous edition: - stating some wording in the scope more precisely; - addition of a measurement method for pans in the definition for normal operation; - new definitions on the topic surface temperature; - deletion of the paragraph with the warning for dangerous voltages (already covered by Part 1); - addition of hot surface symbol IEC 60417-5041; - addition of instructions and markings on hot surfaces and other topics; - addition of requirements, measuring methods and thresholds for different materials on hot surfaces; - modification on leakage current defining the value for appliances with a power consumption less than 1 kW; - modification on the criteria for the stability test; - addition of a requirement for the construction of stationary appliances with rollers or castors; - modification on some points concerning permanent connection to fixed wiring; - addition of specific requirements concerning types of screws to be used for electrical connections and connections for earth continuity; - addition of a figure showing the surfaces to be measured; - addition of a figure showing the probe for measuring surface temperatures and the addition of informative Annex P dealing with leakage currents for appliances used in tropical climates. This part 2 is to be used in conjunction with the latest edition of IEC 60335-1 and its amendments. It was established on the basis of the fifth edition (2010) of that standard. The attention of National Committees is drawn to the fact that equipment manufacturers and testing organizations may need a transitional period following publication of a new, amended or revised IEC publication in which to make products in accordance with the new requirements and to equip themselves for conducting new or revised tests. It is the recommendation of the committee that the content of this publication be adopted for implementation nationally not earlier than 12 months or later than 36 months from the date of its publication. 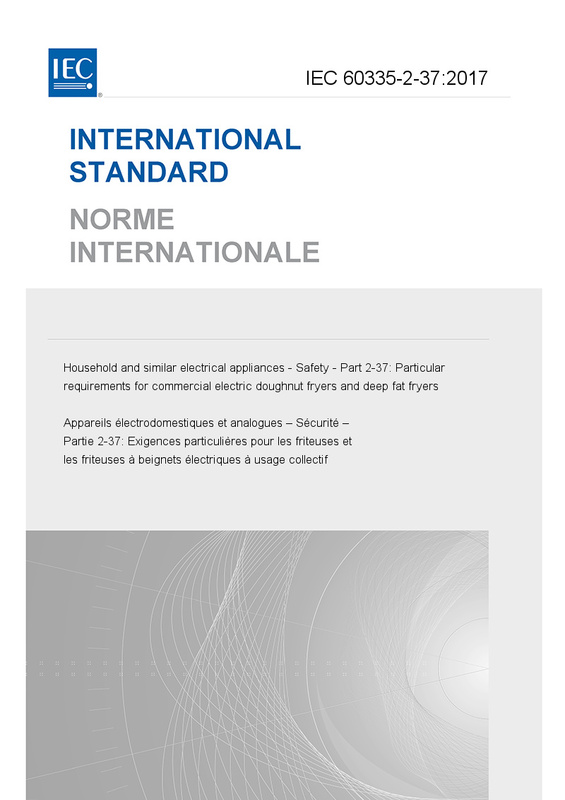 This publication is to be read in conjunction with IEC 60335-1:2010.